In a recent post about cruising, we discussed the importance of placing intriguing objects on the coffee table in various locations to motivate baby to cruise. We recommended choosing colorful, lightweight, and non-breakable items. 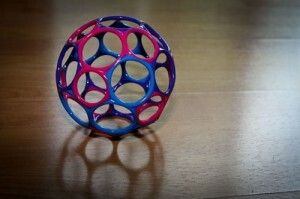 This toy, the Oball, meets all of our requirements. A favorite among 9-12 month old babies, this toy also has tiny handles all over it for easy gripping. The extreme lightweight plastic material is perfect for one of the games baby enjoys playing at this age. Put the Oball on the seat of a chair. When she is standing near, show her how to take her hand or arm and push it off the chair seat. Next, you pick it up right away and place it back on the chair seat. She will knock it off again. Once again, immediately pick it up and put it right back on the chair seat. She will think this is fun and want to continue. This is an important developmental game for baby at 9-12 months. Babies learn at a much earlier age to grasp things and shake them, and now they learn to release objects from their hand and to push them. This is another dimension of the skill of grasping and reaching. It could be called “releasing and pushing.” Previously, baby reached to get something that she wanted. Now she is extending the arm in a similar way to reaching, but it is called pushing because the object moves away from baby. Often parents think it is an accident when the baby drops the toy she is holding, and they reflexively pick it up and hand it to her again. It takes awhile for the parents to realize it is a new action baby has learned, and through repetition, the learning is deepened. Repetition gives baby a chance to be very clear about how to make that action happen. Again and again, baby will repeat the action until the novelty has worn off. How do babies learn to walk? In the above video, Rochel begins to walk forward toward her mother. She is still holding on to the coffee table, part of the side cruising skill. However, some of her steps are now moving forward rather than sideways. She only needs to hold on with one hand, not two. Observe the close-up shot of her feet. You can see her take one step forward with the right foot, then the left foot moves sideways, toward her right foot as in side-cruising. She is still moving forward, but is slowed down somewhat by the occasional side step which is from the familiar side cruising skill. Soon she will figure out that she gets where she wants much faster with only the forward moving steps of walking. Cruising is the first motor skill where baby is supporting all of her weight on her feet. It has taken many months for her baby bones and baby muscles to strengthen enough for this advancement in skill. Observe the flat shape of the feet. Moving in this upright position will begin to develop the muscles and arches of the feet that are necessary for balance, support, and locomotion in this vertical position. An important aspect of motor skill development is transition, especially for changing levels. We all have to learn to move from sitting to standing, standing to sitting, standing to crawling, rolling to standing, etc. Rochel demonstrates perfectly how to transition down to the floor. She steps forward on her right foot, shifts her weight onto that foot, which frees up her left leg so she can bend it underneath her. Then she slowly bends her right leg to lower her pelvis down to the floor. Through much practice, she has developed strength in her legs so she can make this movement quite slowly. She immediately transitions again into a quick scoot to get to her toy, the stuffed animal. The skill of sitting is a transition to move from standing and walking to crawling on the floor. Once again, her movement is motivated by her desire to get to her favorite toy. Parents celebrate the motor milestone of cruising as it indicates baby will be walking very soon. Cruising is the motor skill of standing up and taking small steps sideways while holding onto a stable object such as a coffee table. 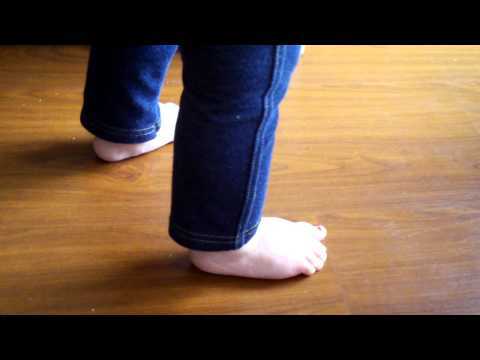 It is a very important preparation for walking because it it the first skill where baby is fully weight bearing on her feet. By 10 months or so, her bones are strong enough to support her weight. Her muscles have developed quite a bit of strength from crawling. Over the course of several days of pulling herself up to standing, she has developed her balance well enough to cruise after a toy. She takes a couple of small steps, very slowly, in a sideways direction. She is learning to shift her weight, which is no small task. It requires balance, coordination, and strength. She moves one foot to the side by adjusting her weight onto the stable foot, thus freeing the other foot so she can move it to the side. Once the moving foot touches the floor she can put her weight on that foot. Cruising also develops the muscles and arches of the foot which will be necessary for walking without holding on. Parents are often concerned when baby shows a preference for one direction over the other. This is not something to be concerned about, this is actually an advantage. Babies will start to make a preference early on. Most of us have a dominant hand, leg, and eye. Even professional ballet dancers will tell you they can do something better on one side, for example with their right leg. So, parents need to understand that it is a normal part of motor development to show a preference to one side. By setting up the furniture in a safe and attractive manner for the baby to practice cruising, parents encourage the exploration in which the dominant side may emerge. Furniture and toys evoke the curiosity that motivates the cruising and facilitate muscle and balance development. The journal Science published a study in 1977 offering promising evidence of the impact of mild vestibular stimulation on the gross motor skill development of babies. Babies ranging from three to thirteen months were subjects of a research project. The gross motor ability of each baby was evaluated prior to the project. Each baby received sixteen sessions of chair spinning (four times a week for four weeks). The researcher seated an infant on his lap and spun around in a swivel chair ten times, and after each single spin he made an abrupt stop. The objective was for the infants to receive stimulation of the three semicircular canals of the vestibular system. The researcher varied the position of each baby from the following three positions: sitting with the head tilted slightly forward, side-lying on the left side, and side-lying on the right side. The variations in positions provides stimulation to each of the three canals in the vestibular system. The babies loved this experience, and they expressed it through laughing and babbling! Often, they fussed when the chair stopped for its thirty-second rest between spins. In addition to this group that received the chair-spinning, there were two “control” groups of infants. One group that did not spin at all, and one group that sat in the chair on a researcher’s lap for sixteen sessions, but did not spin. The results showed that the group which received the chair spinning treatment improved in their motor skill development significantly more than the infants in the two control groups. The babies who were spun showed advanced development of not only their motor skills, but also their reflexes. It is noted that the gross motor skills of sitting, crawling, standing and walking were particularly improved in the group which received the stimulation. What we learn from this experiment is that it is not only muscular strength that is necessary to develop motor skills, but also vestibular activity. 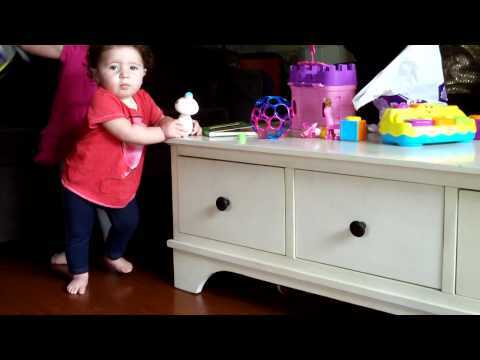 When baby learns each of the Stellar Caterpillar “Top 10″ motor skills, she is receiving vestibular stimulation which facilitates learning her next motor skill. After baby learns “lifting the head,” which brings a certain amount of vestibular stimulation, she learns “rolling.” When baby learns to roll, she often rolls across the floor, which brings an increase in vestibular stimulation. This level of stimulation does not occur with a random roll, but with a series of rolls, one after another. It also stimulates different canals from lifting the head. From the above experiment we know that babies who receive vestibular stimulation may show advanced development of gross motor skills such as crawling, standing, and walking. By “advanced development” we do not mean that they achieve these milestones earlier than average, but they acquire them with advanced skill. Advanced skill means they perform the skill deliberately with repetition, confidence, and optimal mechanics. The motor milestone occurring in the development of a baby prior to walking is called cruising. The major event of a baby learning to stand opens the door for the advanced motor skill of cruising. 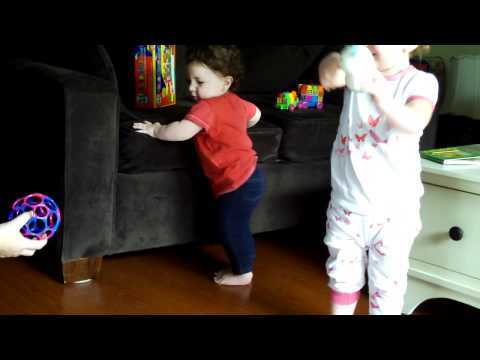 Once standing, baby takes small steps sideways while facing and holding onto a stationery object such as the seat of a chair. This is the transfer of weight from one foot to the other. This is often called “side cruising” because of the sideways direction of baby’s steps, which differ from the forward direction of steps taken in walking. This shift of weight is essential for walking, which happens in the forward facing direction and without holding on. Occasionally she lets go of her hold and balances awhile. If you observe her feet you can see the tiny movement in the toes and ankles, this is the skill of balance developing right before your eyes. She may look like she is not doing anything but standing and looking at you, but look down at the feet and you will see a great deal of work occurring! Notice the wiggling of her little feet from the inside edge to the outside edge and back again. There are many muscles in the feet that are learning to work and develop strength. Pretty soon she will not be holding on! Remember Lucy, our rising star? Lucy refined the skill of standing in her last lesson, and began cruising. I put two or three chairs close together with a ball on the seat a bit out of her reach. She felt confident to hold onto the chair seats and take just a few steps sideways. I showed her mother how to take a finger and gently press each of Lucy’s toes down into the ground, reminding Lucy of the connection to the floor. After Lucy walked a couple of steps we put the ball a little further away, encouraging her to take a few more steps. It is important not to put the toy too far away at first – we want baby confident she can attain her goal! When Lucy feels stable in her feet she will have the confidence to let go. Now that baby is moving in the new upright position, the legs and feet are bearing more weight. The weight of the body when it is closer to the ground and being supported by the hands and knees is less than when it is upright and supported only by the two legs and feet. Shifting weight, improving balance, and increasing strength create the perfect prelude to walking. Enjoy the security while she still is holding on – it won’t be long now!